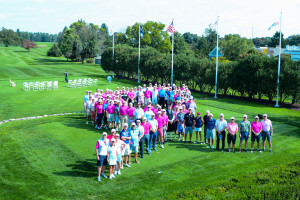 A charity initiative by insurance services company Thomas Miller ( Americas) Inc has very nearly broken the half a million dollars barrier in funds raised for the Breast Cancer Resea rch Foundation over the last three years, thanks to the ‘Play for Pink’ Golf Day held last month. A total of 112 players representing companies throughout the US maritime and insurance community and also from Venezuela and Panama participated at the Forsgate Country Club in New Jersey. This was a corporate golf day with a difference and thanks to the generosity of the hosts, sponsors and guests, it will make a real difference in the fight against breast cancer. $206,000 was raised to add to the ‘Play for Pink’ donations from the last two years in order to reach a total of just under $500,000. Thomas Miller is the manager of shipping and transport insurance mutuals, UK P&I Club and TT Club. Mike Jarrett, president of Thomas Miller (Americas) Inc thanked all the participants, “The commitment of the UK P&I and TT Club members as well brokers, attorneys and industry consultants in supporting our fund-raising efforts is astonishing. I’m proud to be able to bring together the maritime community in the US to help research into the eradication of breast cancer; a blight that has touched us all either directly or indirectly”.